"This president owes Admiral McRaven and all of the SEALS involved in that operation an apology for what he's saying," Leon Panetta said. Former top members of the intelligence community rebuked President Donald Trump on Monday for deriding the retired Navy SEAL who oversaw the 2011 raid that killed Osama bin Laden as a "Hillary Clinton backer" and suggesting that he should have caught the al Qaeda leader sooner. Brennan is a senior national security and intelligence analyst for MSNBC and NBC News. Trump revoked Brennan's security clearance in August, prompting McRaven to write an opinion article for The Washington Post urging the president to revoke his clearance, as well, so that he could "add my name to the list of men and women who have spoken up against your presidency." “It reflects, I think, his complete ignorance about what that took,” he said. Meanwhile, Robert O’Neill, a former Navy SEAL who claims to have fired the shots that killed bin Laden, told NBC News' Hallie Jackson Monday that "what the president said about McRaven" was "a little inaccurate"
"The raid to get Osama bin Laden was not only bipartisan, it was non-partisan. Everybody involved wanted to get him as soon as we could get him," O'Neill said. 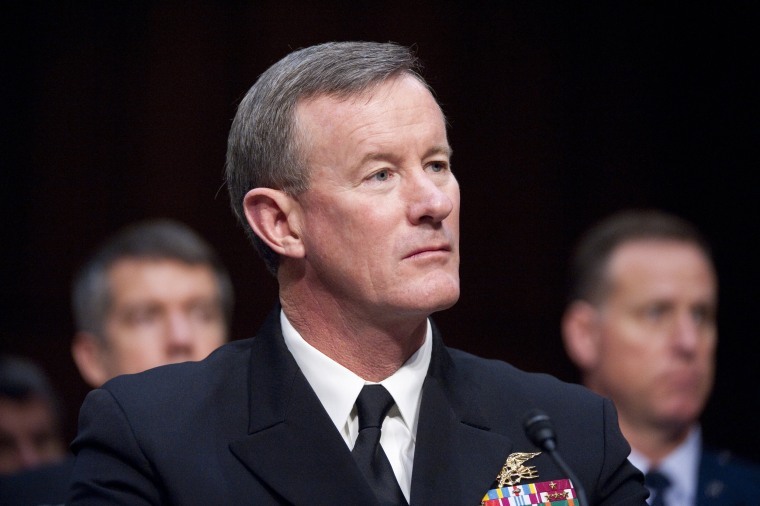 "Admiral McRaven is the reason that my SEAL team got it and Obama approved it. That's just as simple as it gets," he added. In an interview with Chris Wallace on "Fox News Sunday,” Trump blasted McRaven, who oversaw the raid, as a "Hillary Clinton fan" and said bin Laden should have been captured much sooner, though he did not explain how the Obama administration should have done so. The president made the comments after Wallace asked him about McRaven's criticism of Trump's attacks on the press. Last year, McRaven, who did not make an endorsement in the 2016 presidential election, called Trump's lambasting of the news media possibly "the greatest threat to democracy in my lifetime" during a speech at the University of Texas. Of course we should have captured Osama Bin Laden long before we did. I pointed him out in my book just BEFORE the attack on the World Trade Center. President Clinton famously missed his shot. We paid Pakistan Billions of Dollars & they never told us he was living there. Fools!.. McRaven responded on Sunday, telling CNN that he did not support Clinton or anyone else in the 2016 election. He emphasized that partisanship did not play a role in his career. On Monday morning, however, Trump doubled down on his remarks, tweeting that, "Of course we should have captured Osama Bin Laden long before we did."